A durable and versatile method of floor marking makes Shot Blasting the preferred choice of prepared line marking by most, thanks to the speed of preparation and potential performance. 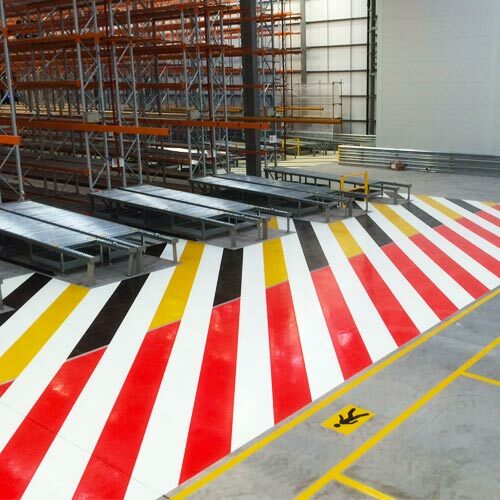 Specified for facilities with busy FLT movements, shot blasting can be installed on most floors, making it suitable for old and new warehouses or distribution centres which need cost effective floor marking, but where long-lasting durability is not essential. Shot Blasting is the method of hitting the concrete floor with ‘shot’, a small piece of metal which strips the surface to leave virgin concrete. The ‘Shot’ is able to remove to various depths depending on the machine used and severity of the impact. Typically a depth of 1mm to 3mm is achieved providing a surface for the paint to key with. Two part epoxy resin is the preferred paint system used with this method of prepared line marking, however in some cases we may need to use other types to ensure the best possible finish and durability. The finish is not as crisp or durable as Diamond Shaved, however this is reflected in the cost, which makes Shot Blasting a more viable alternative for some organisations. Click on the below data sheet to read more about shot blasting at Warehouse Partners. Download the Shot Blast Data Sheet.